Untrained observers frequently confuse superficially similar small arms and light weapon (SALW) systems, particularly with the pressure of covering a current conflict. These mistakes can act as a red herring for those seeking to establish the objective reality on the ground, or at worst, incorrectly act as evidence of involvement by external parties. 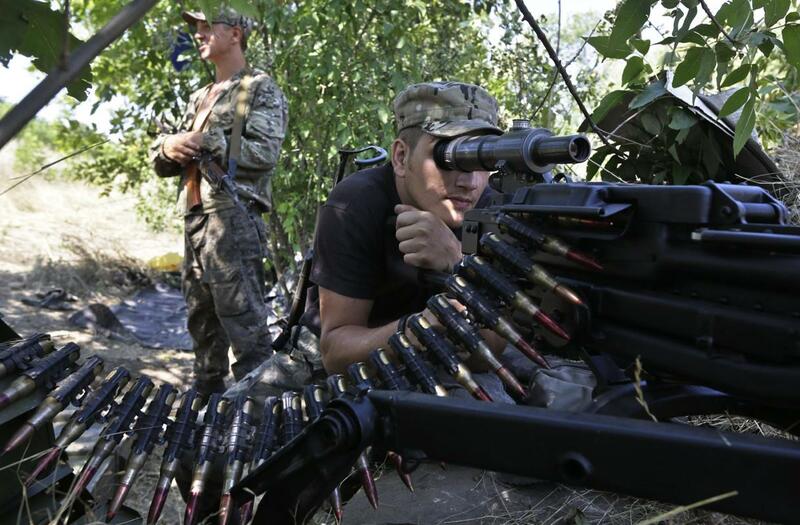 The current conflict in Ukraine is a great example of such a situation, with many subtle variants of former Soviet and Russian weapon types employed by both sides. 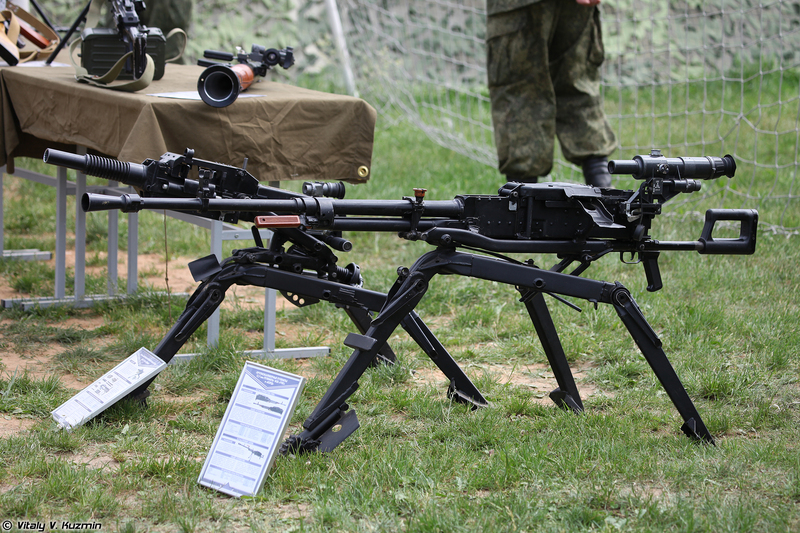 A report from June this year claimed to have identified the relatively modern ‘Kord’ heavy machine gun (HMG), ostensibly in Russian service only, in the hands of pro-Russian separatists. 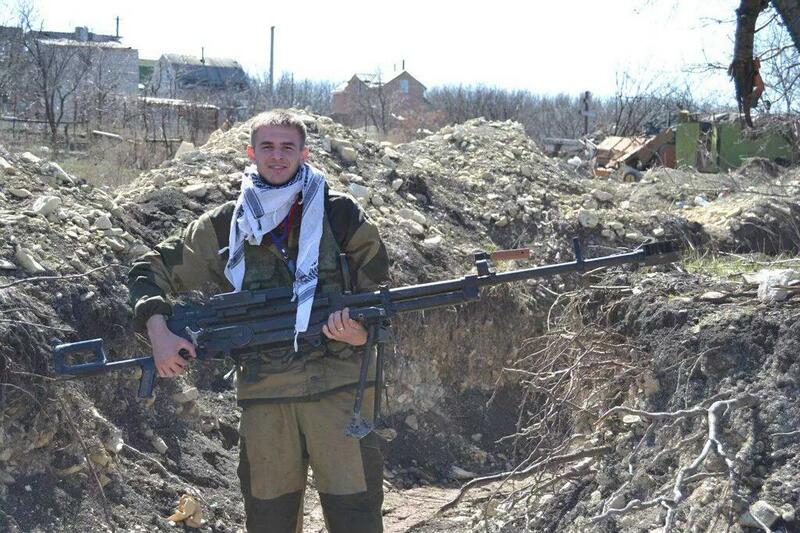 Needless to say, the presence of this weapon would be a significant indicator with regards to the supply of SALW to separatists in eastern Ukraine. However, as was briefly mentioned in the latest ARES report, this particular identification proved to be in error. The HMG in question was actually the rather more innocuous 1970s vintage NSV,which is in service with both Ukrainian and Russian armed forces (and several others around the world). This mistake was an easy one to make, because the two weapons are, externally at least, remarkably similar and difficult to tell apart without access to internal components or visible designation markings. They are also both still in production; the NSV in Kazakhstan, Poland, and elsewhere, and the Kord in Russia. As yet, ARES has not seen evidence of Kord HMGs in eastern Ukraine, although other recently-produced Russian arms and munitions were identified. Research for this report found no published method for differentially identifying the NSV and Kord, in the Anglophone world at least. We therefore present our findings in hope that they will aid other researchers in the field. The design of the NSV Utes (Утес; ‘Cliff’) dates back to 1969 and the weapon is named for inventors: Nikitin, Sokolov, and Volkov. 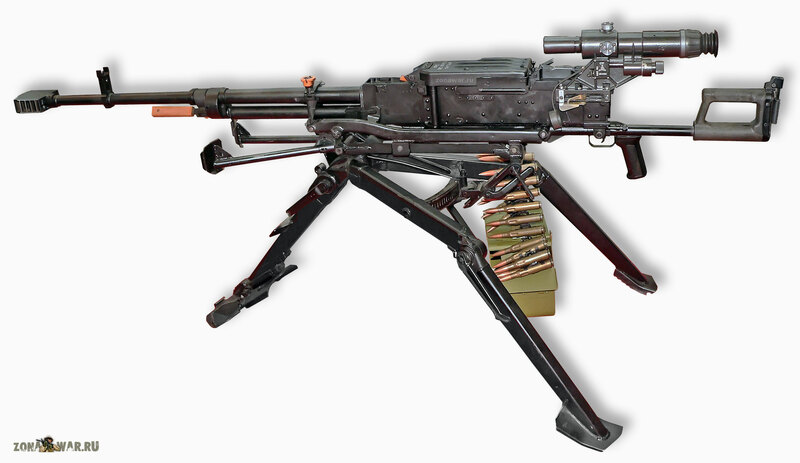 It has traditionally seen service as an armoured fighting vehicle (AFV) machine gun, but can also be tripod mounted, in which role it is more properly designated NSVS-12.7 or NSVS-N3. It is noteworthy for employing an unusual manifold breech block design containing three side-folding ‘sub-blocks’ (see Jane’s 2014 for details of operation). The older of the two designs, it is currently known to be manufactured by Metallist JSC and Kaspex, both based in Kazakhstan. Left side view of a NSV HMG on a tripod mount. Note in particular the riveting down the side of the receiver. Right side view of the same NSV. The location of NSV production, in Kazakhstan, presented a problem for the Russian armed forces following the break-up of the Soviet Union. A replacement was commissioned, apparently with some leeway in design specification, because the entirely new team (Obidin, Bogdanov, and Zhiryokin) created a rather different design retaining little of the original weapon’s internal workings. The detachable barrel system was retained, but much of the mechanical design was abandoned. A new rotating bolt operating system was designed, resulting in reduced recoil and increased accuracy (and probably increased reliability) over its predecessor. The Kord entered service in 1998 alongside existing examples of the original NSV. It is produced in Russia by V.A. Degtyarev Plant JSC, Kovrov. Left side view of a Kord HMG on tripod mount. Note in particular the forward portion of the receiver, with less rivets and a different rivet pattern when compared with the NSV. 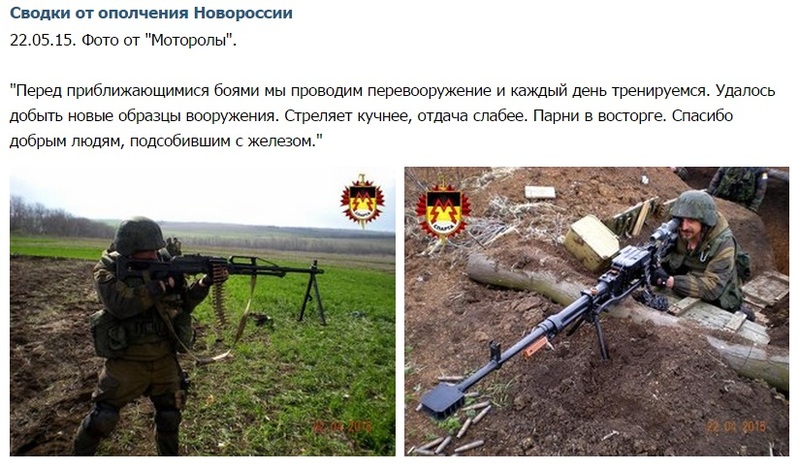 Also note the attached bipod. Right side view of a Kord on a bipod mount. A number of differences are apparent from examination of photographs, yet some of the more obvious are not actually definitive and may result in misidentification. This is a particularly easy mistake to make if the two weapons are not compared to one another. Black polyamide furniture may be more advanced than wood or bakelite, but it is to be found on both types depending upon date of production, and could conceivably be retrofitted to older receivers. 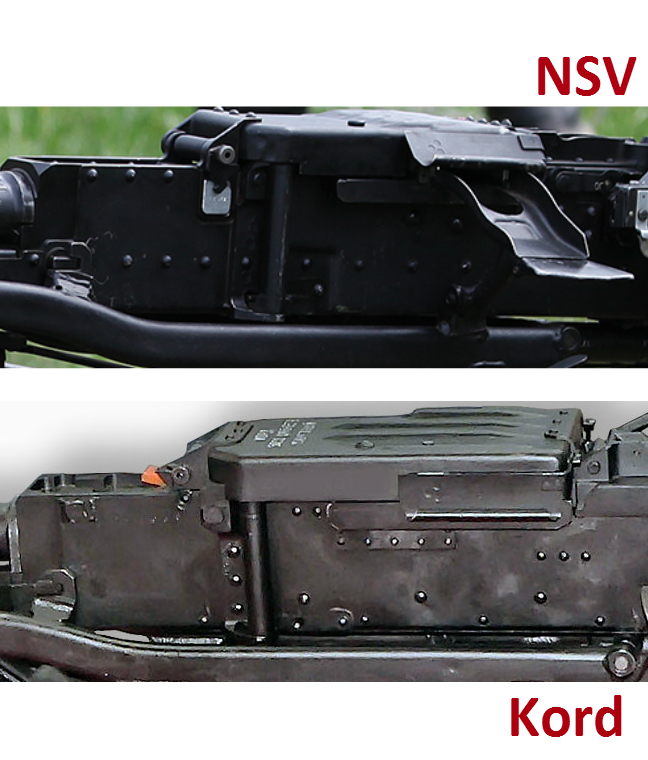 Whilst the traditional conical flash-hider of the NSV is not likely to be seen on the Kord, some examples of the NSV feature one of two Kord-style muzzle brakes, an earlier cylindrical pattern, and the flat, chambered design in production currently. 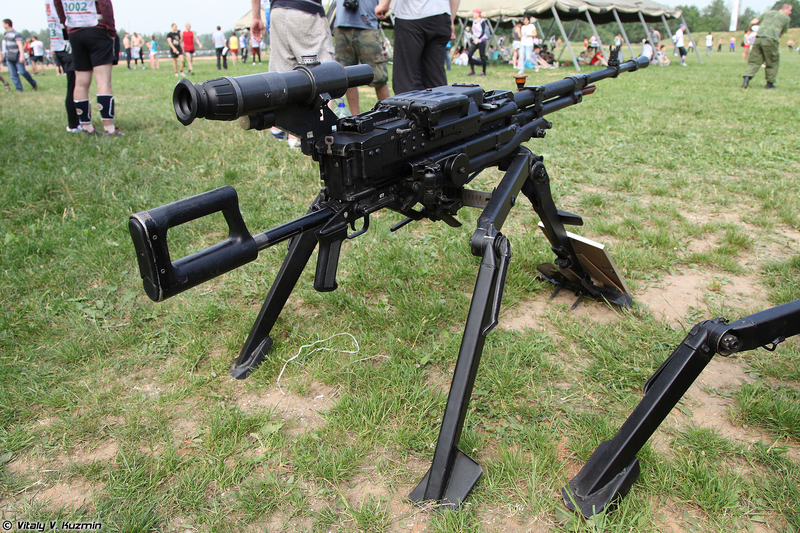 Additionally, the Kord is fitted with the 6T19 bipod as standard, and this remains in place when the weapon is also tripod mounted, acting as another identifying feature of the type. By contrast, no bipod appears to have been designed for use with the older NSV; instead, it uses heavier mounting systems like the 6T7 tripod. Anecdotally, this is due to the reduced recoil of the Kord’s new operating system. These features may or may not appear on a given example, or be visible from a given photographic angle. However, there are diagnostic features of these types that should be visible either to first-hand observers, or indeed in a variety of photographic angles. The Kord is, by design, a product-improved NSV. However, the changes made were far more extensive than the better-documented alterations of, say, PK to PKM, or even AK to AKM. These fundamental design changes resulted in a very different receiver that retains common external features only where necessary for compatibility with existing NSV mounts and accessories. The true diagnostic features of the Kord are in the receiver, most evidently its left side, where there is a marked absence of rivets on the forward portion (see the image below). The right side is likewise considerably less cluttered on the more modern Kord. These features should prove diagnostic in most situations. Header image credit: Sergei Gritts/AP. Other images from Vitaly V Kuzmin and zonawar.ru. Data from world.guns.ru, and Jane’s Infantry Weapons 2013-2014. Special thanks to Forgotten Weapons and Grzegorz Plichta. Special thanks to Yuri Lyamin.